The Pearl Izumi Men's P.R.O. AmFIB Lobster Glove uses 130 g Primaloft® Gold insulation in combination with a waterproof inner layer and a DWR-coated shell to seal in warmth and block out the worst winter conditions. Its lobster design pairs the fingers together to concentrate body heat, and the fleece liner provides soft respite from unrelenting rain or snow. On the exterior, a Clarino™ synthetic palm provides outstanding durability, and a fleece surface on the back of the thumb is a convenient wiping surface. The gloves stay secure using a hook-and-loop closure, which ensures a consistent fit from the 1:1 palm for the utmost dexterity and comfort. The weather has not been that cold day 35 is the coldest so havent put them through the real test yet. Hands are staying warm. Takes a little to get used to shifting but they were a good investment. very well made gloves . these are great . bought them to replace the old pair that took a crap after about 15 years of abuse . I wear these gloves for winter fat biking below 32 degrees F. Have worn them down to 15 degrees F for duration of 2 hrs....no problem. No problem shifting or braking. Highly recommend. 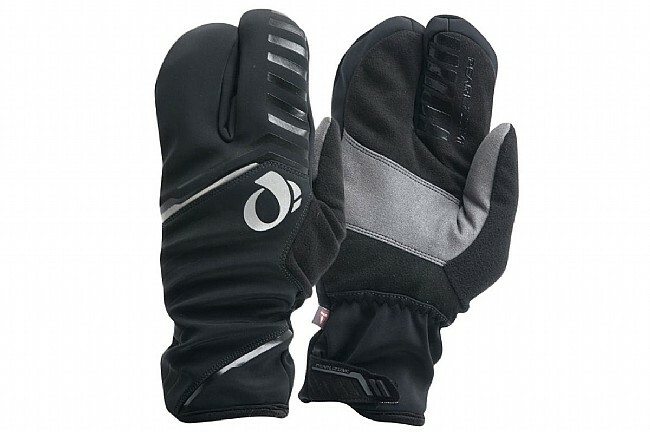 This glove is made for COLD weather riding and will keep your hands warm, maybe too warm if your wearing them when it isn't that cold,causing your hands to sweat. Also takes a little getting used to shift with two fingers and gripping handlebar under attack mode. These have been great. Ive used them in -10F with hand warmers. My hands were a little cold by the end of my 6 mile commute, but i still had feeling in my fingers. if I had warn a wool glove liner im sure i would have been comfortable. These gloves keep my fingers warm, and they allow for more agility than expected, i had no issues shifting with my shimano brifters. Very nice lobsters. Kept my fingers warm down to 25 degrees. Riding in the fall up to Thanksgiving in Minnesota. Very easy to handle the bike braking and shifting with this glove on. Worked great with my brakes & shifters as well as keeping my fingers nice and warm. I wear them on sub 45o days. Having a few fingers connected really makes a difference as does the fluffy warm fleece. They just take a little getting used to at first with only a little less dexterity. When I wore them on a rainy ride they did get pretty soaked through. Not waterproof! They do protect you from wind however. This is my second pair of these gloves. The lobster style design keeps my fingers nice and toasty even on the coldest days. And they keep your hands dry in a heavy down pour. Just be prepared to look a little goofy. First ride with these gloves was in 18 degree weather on Long Island with 15mph winds. The rest of my body got cold after the first 25 miles but my hands were warm and toasty the remainder of the ride. Needed a few more long rides to get used to the lobster glove with limited dexterity but now they are my favorite gloves for extreme cold days. Although you lose a little dexterity, these are the best for cold weather. Even in rain my hands stayed dry & toasty. Bought these gloves for my husband for Christmas. He said that the fit is good, they are comfortable & warmest gloves hes ever had. Coldest winter here in a long time & he has biked and cross country skied in them and was thrilled that his usually frozen hands werent!! Thanks for fast shipping on a great pair of gloves! These gloves are very warm. They are surprisingly water resistant as well. I have had several rides in total downpours and my hands have been the only part of me that remained dry.